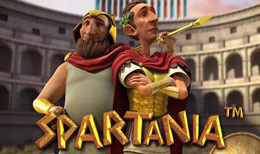 Take on the reels of the Roman Empire in all its glory in Spartania. Dawn your gladiator helmet and head to the Coliseum to collect gold and riches worthy of Caesar himself. This action-packed slot is filled with epic bonus features like the wheel of fortune and a special animated bonus feature game. Step into your chariot and find your fortune in Spartania!